During summer and fall of 2016, Last Chance for Animals (LCA) conducted an investigation at ITR Canada Ltd., a contract toxicology research facility in the suburbs of Montreal, Quebec that performs laboratory studies on beagle dogs, mini-pigs, and macaque monkeys. Throughout the investigation, LCA documented an ongoing pattern of animal abuse and neglect in clear violation of provincial animal protection laws and animal testing guidelines. Abuses often happened in full view of supervisors, who made no effort to prevent further abuse or to correct systematic neglect of the animals. LCA has submitted evidence in official complaints to Le ministère de l'Agriculture, des Pêcheries et de l'Alimentation (MAPAQ), Le ministère des Forêts, de la Faune et des Parcs (MFFP), Ministère de l'Énergie et des Ressources naturelles (MERN) and is demanding enforcement. Watch the video narrated by Joaquin Phoenix: LCA Investigation Reveals Cruelty at ITR Toxicology Research Lab! "Kept for years, their life is a toxic nightmare." Demand justice for Grace and for all of the animals documented during LCA’s investigation. Sign to urge authorities to prosecute ITR and all individuals responsible for this horrific abuse! For four months in 2016, a Last Chance for Animals (LCA) investigator worked at International Toxicology Research Canada (ITR), located in Baie d’Urfe, Quebec (a suburb of Montreal), and documented numerous violations of provincial regulations covering the humane treatment of animals. One of these victims was Grace, a young macaque monkey who turned in endless circles in her cage. and had patches of fur missing from her skin, both signs of severe stress caused by confinement and a lack of any stimulation or socialization with other animals. When LCA’s investigator pointed these symptoms out to an ITR employee responsible for the animal’s’ daily care, they were instructed not to record Grace’s condition, blatantly disregarding guidelines for the daily assessment of animals in laboratories, which require the measuring of behavioral well-being indicators. 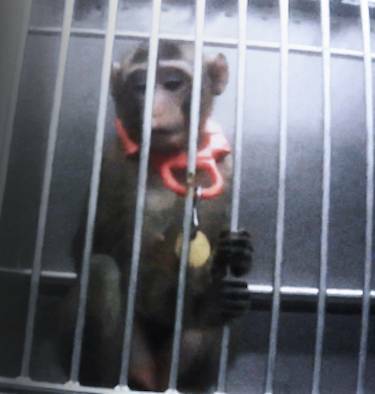 Grace was treated as nothing more than another piece of lab equipment -- but she isn’t. She is a young animal who will be kept alive for years, maybe even decades, her body used in study after study as she suffers the painful effects of the toxins that she is forced to consume, and the isolation, fear, and constant stress that life in a laboratory will mean for her. No animal deserves this treatment. An anecdotal instance of a macaque left unsupervised while restrained in an inhalation device and subsequently suffocating to death.